The Alumni awarded its 15th Staff Bursary at the 2006 Alumni Weekend. 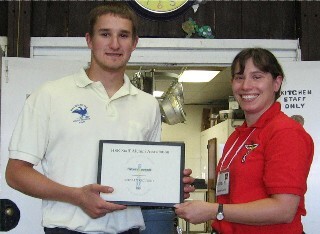 Dean Janowski (2002-2008) from Kitchener, was the recipient of the $700 award. Like most staff, Dean was introduced to HSR as a camper. Dean has been on staff for five years beginning in 2003 as a Staff-In-Training, moving on the (barely) paid staff position of Composite/ Climbing Wall instructor in 2003, to Maintenance from 2004 to 2006.